A huge announcement came this week from the University of Tennessee and it was geared towards one word; UNITY. While making the transition from Adidas to Nike as their apparel provider for merchandise; the University was compelled to no longer identify the women’s sports teams as the “Lady Volunteers”. In case you’re not familiar with Tennessee as a College institution or their athletic department here is a quick synopsis. Now generally speaking, Women’s Athletics in Tennessee has always had this moniker & even the subtle blue incorporated in their uniforms to further distinguish themselves as the “Female Athletes” in Tennessee. 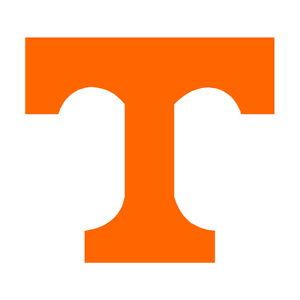 When negotiating with Nike it was important in restructuring the brand of the Tennessee Vols to be on a unified front as opposed to separating men & women’s athletic clubs. However, the University also mentioned that there will be one exception to that rule in that now the women’s basketball team will be the only athletic program to display the moniker “Lady Volunteers” while the other women’s teams will fall in line with the rest of men’s athletics with a singular logo and distinction. So why the special treatment for one particular ball club? Although there is some credit for paying tribute to Tennessee’s most beloved figure in their sports history; it’s also clearly evident from the University chancellor’s statement that from a financial stance, the University can’t afford to jeopardize losing revenue from one of their most successful programs. Although women’s Athletics makes nowhere near the amount of money that their male programs do specifically football via donations, ticket sales, etc., there’s no question that Tennessee’s recent financial struggles are affecting every decisions that University is making as it relates to its college athletics. 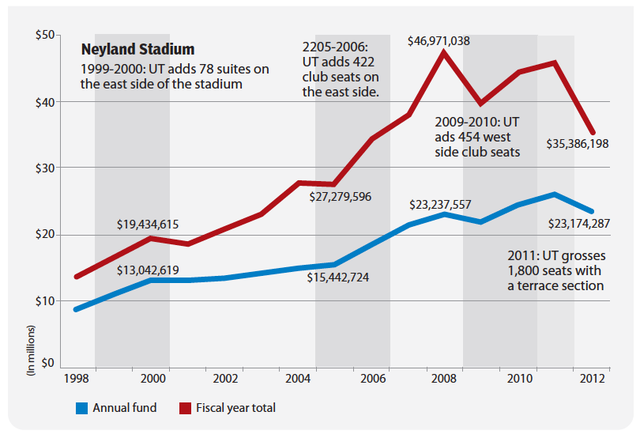 With a mediocre football program, declining stadium attendance and booster donations; the Tennessee Athletic department is in dire financial straits in the form of a staggering $200 million debt. 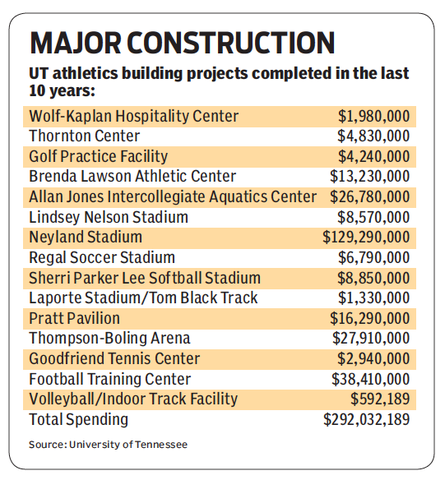 A number that large doesn’t look as outstanding considering the fact that over the past decade the University has spent a little under $290 million towards new buildings geared towards athletics. This statistic is a big reason why they are revamping the whole athletic program with the help of Nike. Also, the data shows why they are consolidating not only the Tennessee Volunteer brand for both Men & Woman (excluding women’s basketball) but also their athletic departments which also used to be separate. This revamp is a harsh reality of how important college athletics is the financial success of colleges across the nation and how it inevitably affects the University as whole. For the athletic department to have that much money in debt towards athletics is not a positive message to send to millions of people who struggle to afford paying for college. It’s even worse for the collegiate athletes that have played for Tennessee (male or female) who were injured while playing and aren’t under any $7 Million buyout from the school like former head coach Lane Kiffin. Unfortunately this is just the nature of the NCAA as a whole in America. While smaller public schools like Elizabeth City State University are struggling to stay open; the University of Tennessee is trying to project how many millions it will make from the new Television deal the SEC made with ESPN & CBS networks. Separate but equal indeed.